Lightened up Green Bean Casserole with a homemade mushroom cream sauce and crunchy panko onion topping! 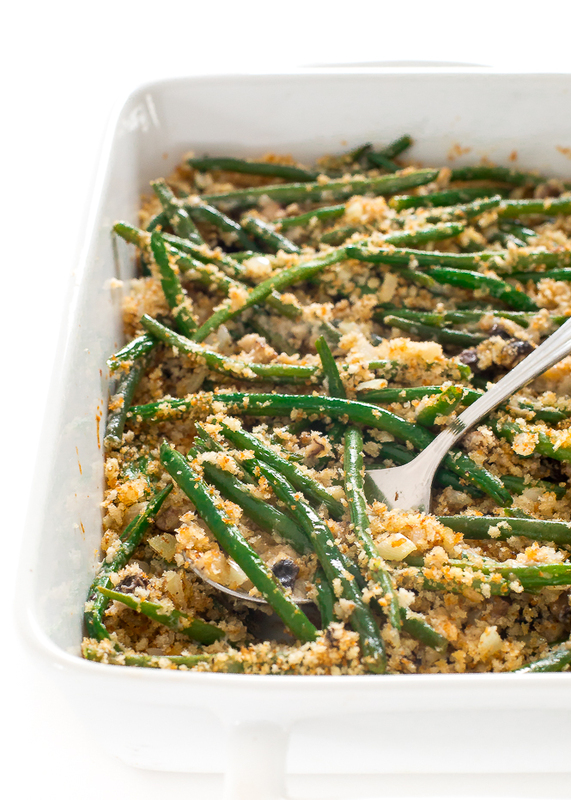 This Green Bean Casserole is the perfect side dish to bring to any gathering. 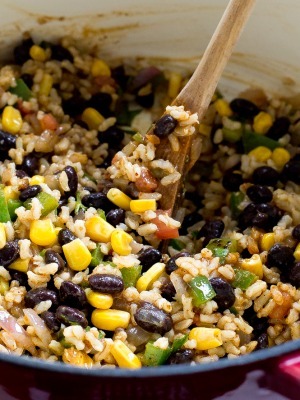 I took this casserole and made it healthier with all homemade ingredients. There is no canned soup or crispy canned onions in this casserole. Instead of using canned soup I opted for my own homemade mushroom cream sauce. I saute mushrooms in butter and add flour to thicken the sauce along with milk, chicken stock and parmesan cheese. 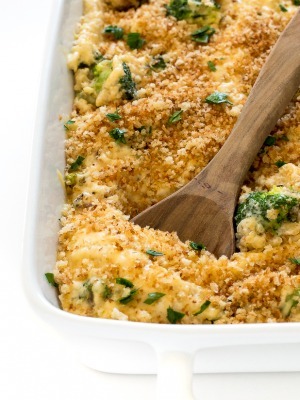 To give this casserole lots of crunch I top it with toasted panko breadcrumbs and diced onions for my crispy onion topping. It is so good! Fresh green beans are best in this recipe however I have tried it with frozen green beans in a pinch. If you are using frozen make sure to drain any excess moisture out of the beans before adding to the mushroom sauce. Once your mushroom sauce is done toss with the sautéed beans then place in your baking dish and top with the crispy onion panko topping. Bake for 20-25 minutes or until heated though and the breadcrumbs are golden brown. 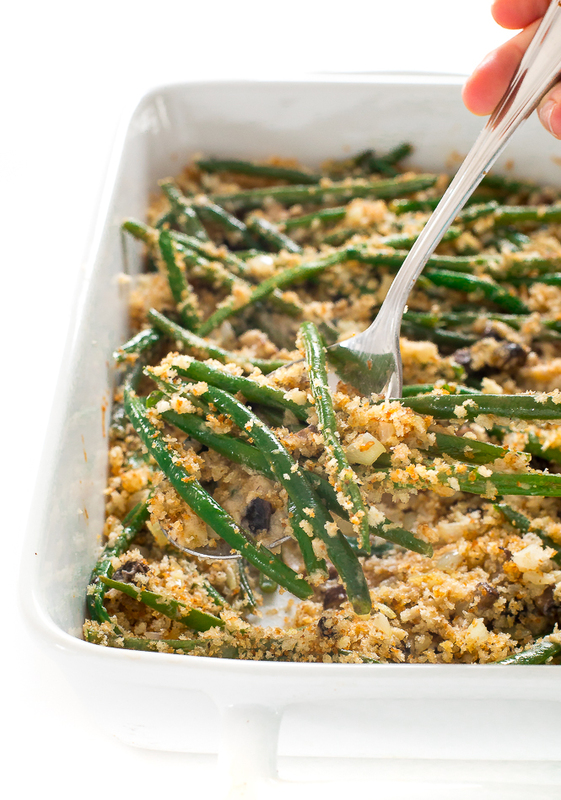 Add 1/2 tablespoon of butter to the same skillet as the green beans. Add onion and sauté for 2-3 minutes or until slightly tender (they continue to cook in the oven). Set aside in a medium bowl. Add the remaining 1/2 tablespoon of butter to the same skillet. Add panko and cook until golden brown and toasted, 1-2 minutes. Remove from the pan and toss with the onions along with the parmesan cheese, salt and pepper. Set aside. Heat butter in a medium sauce pan. Add mushrooms and saute for 3-4 minutes or until tender and golden brown. Whisk in flour and stir constantly for 1 minute. Slowly pour in chicken stock and milk. Allow the sauce to simmer stirring constantly until thickened. 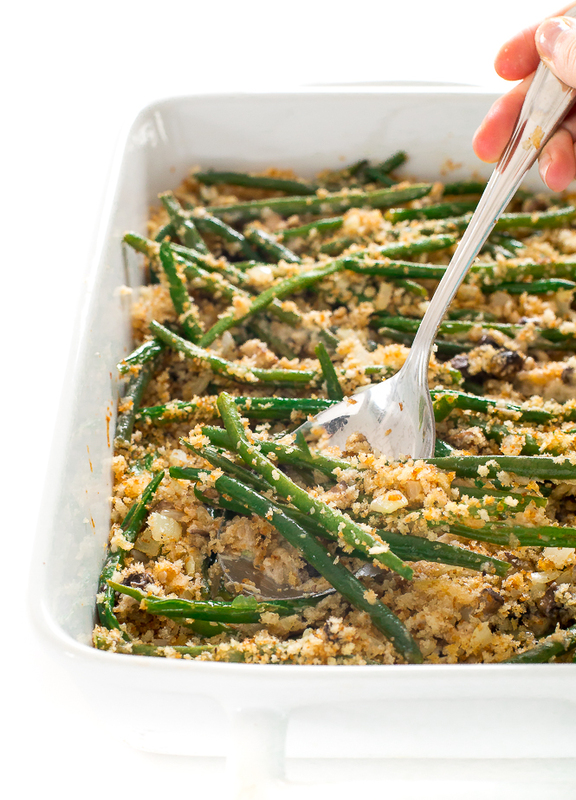 Toss the green beans in the mushroom sauce and spread in a 9 x 13 baking dish. Top with the crispy onion panko topping. Bake for 20-25 minutes or until golden brown and warmed through.